You naturally lose up to 100 hairs per day, but excessive hair loss, known as alopecia, can be alarming. You may lose more hair than usual due to genetic male-pattern balding, certain medications, postpartum hormones or nutritional deficiencies. If you've been following a high-protein diet, you may have eliminated certain foods, causing nutritional deficiencies responsible for your hair loss. The stress of dieting and putting your body into the state of ketosis, when your body has too little glucose and turns to stored fat for energy, can also result in hair loss in some people. If you're noticing faster than average hair loss, consult your doctor to rule out an underlying health issue. Sometimes hair loss occurs as a result of low-protein status, which is unlikely when you're following a high-protein diet that emphasizes your intake of foods such as beef, eggs, pork, fish, tofu and poultry. This increased protein intake usually comes at the expense of carbohydrates, which your body needs for fuel. If you cut calories to a very low level, your liver converts fat into fatty acids and ketones for energy -- creating a state of ketosis. The stress of ketosis can cause hair loss in some people. A study on mice, published in Nutrition in 2013, found that a high-fat, low-carb diet that induces ketosis can lead to biotin deficiency, a side effect of which is hair loss. Not all high-protein diets cause ketosis -- only the ones with extremely low carbohydrate intakes of about 20 grams or fewer and high fat intakes. A high-protein diet is likely rich in the mineral iron, which supports oxygen transportation and healthy blood cells. If, however, you're getting most of your protein from non-meat sources -- especially soy, beans and legumes, which contain a substance that inhibits iron's absorption -- you may not be getting enough dietary iron. Vitamin C enhances iron absorption from plant sources, but if you're also avoiding foods rich in vitamin C, such as citrus, strawberries and broccoli, you aren't getting this benefit. One of the symptoms of clinically low iron levels is hair loss. There are medical reasons why you could have anemia, such as heavy menstrual bleeding, a gastrointestinal disorder or even donating blood too often. Talk to your doctor about your concerns and get your iron levels checked to see if you are anemic and need a supplement. Losing a lot of weight in a short period of time, whether you're following a high-protein diet or not, puts stress on your body, potentially leading to temporary hair loss. Oftentimes, as your weight normalizes and your body adjusts to your new routine, telogen effluvium -- the clinical name for temporary hair loss -- will halt. Note that a balanced diet, and not one that bans entire food groups, is best for the health of your body and your hair. If you try to make up for a nutritionally inadequate diet with supplements, you may also experience hair loss. A 2002 paper published in Clinical and Experimental Dermatology notes that excessive nutritional supplements in the absence of a diagnosed deficiency can cause hair loss. An excess of vitamin A or selenium can be particularly toxic. 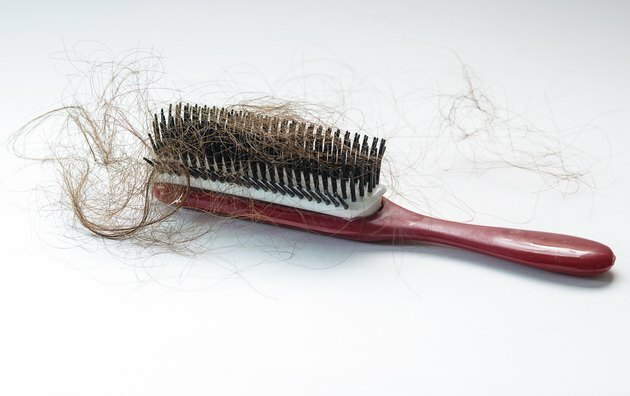 A high-stress lifestyle or a sudden stressful episode, such as a major illness or accident, can alter the hair growth cycle and lead to excessive shedding temporarily. Certain medical treatments, including chemotherapy, some blood thinners, antidepressants and blood pressure medications, are also responsible for hair loss that seems greater than normal. Discuss your hair-loss concerns with your doctor to rule out an underlying medical cause. Joy Bauer: Hair Basics: How Does Food Affect Hair Health? The Charlie Foundation for Ketogenic Therapies: What is the Ketogenic Diet? Can Amino Acids Affect Hair Loss?